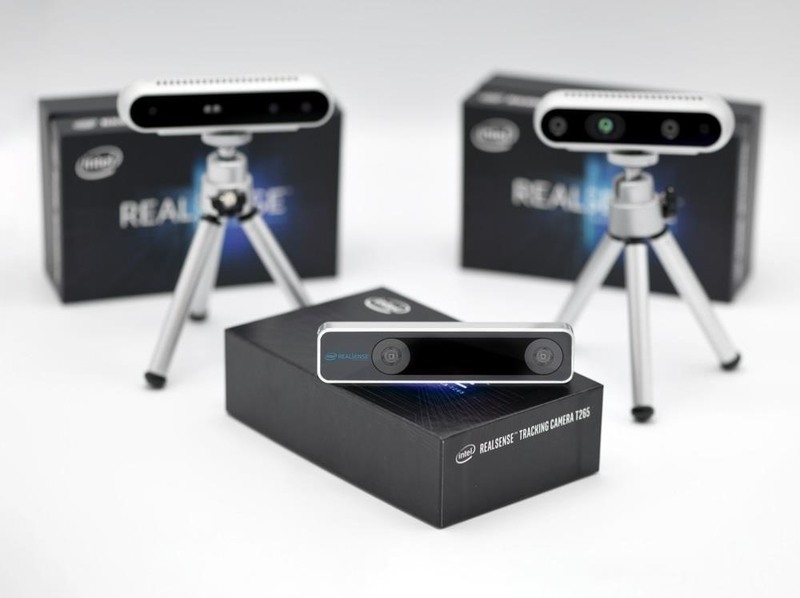 Intel's RealSense family of depth tracking cameras has a new addition with a different set of sensory capabilities. On Wednesday, the technology company unveiled the Intel RealSense Tracking Camera T265, which provides six degrees of freedom (6DoF) inside-out tracking for augmented and virtual reality headsets, robotics, and drones through a "proprietary" mix of visual inertial odometry (VIO) and simultaneous localization and mapping (SLAM), which Intel has decided to call V-SLAM. "Understanding your environment is a critical component for many devices," said Sagi Ben Moshe, vice president and general manager of Intel's RealSense Group, in a statement. "The T265 was designed to complement our existing Intel RealSense Depth Cameras and provide a quick path to product development with our next-generation integrated V-SLAM technology." The T265 crunches tracking data on a visual processing unit (VPU), namely Intel's own Movidius Myriad 2, which enables the camera to run energy efficiently within a compact package. The T265 is available for pre-order today, with shipping set to commence on Feb. 28. As a longtime behemoth in the tech industry, Intel represents a daunting challenge to companies like Occipital, which also produces depth sensing and tracking modules. Less than two months ago, Occipital introduced the Structure Core, which handles environmental mapping and tracking in the same module, whereas Intel requires two separate RealSense modules to handle the same chores. However, Occipital currently sells Structure Core for $499, with the price dropping to $399 for those willing to wait until March to receive their device once production ramps up for general availability. Intel prices the T265 at $199, the same price as its latest depth camera model. So while Occipital offers more capabilities in a compact form for (eventually) about the same price as Intel's RealSense combo, the company still has to overcome Intel's name recognition and the sales infrastructure that comes with it.